Yesterday at its I/O developer conference, Google introduced its new take on bringing the power of Android to the living room with Android TV. Google’s new “L” version of Android will power set-top boxes and full TV sets from Razor, Asus, Philips, Sony and more bringing voice control and gaming capabilities to the entertainment experience. 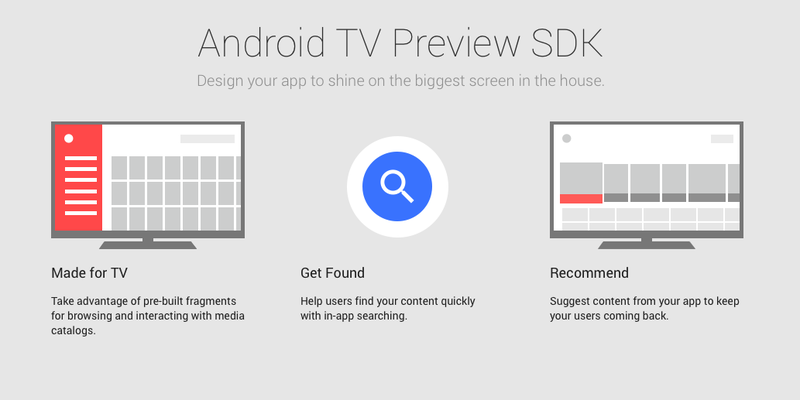 In addition to making an Android TV SDK available later today so developers can create software for Android TV, Google has already released a remote control app on the Play Store for use with Android TV when it’s available later this year. Google notes that the app is intended to work with the ADT-1 Developer Kit. The app features both a d-pad and touchpad for using your Android device to maneuver around the Android TV interface. Android TV Remote Control is available today on the Play Store. This app includes Google Cast receiver for Android TV platform. Available and pre-installed only on Google approved Android TV devices. Open source licensing and source information can be found at https://code.google.com/p/android-cast-mirrored-source/. When Android TV hardware launches later this year, this software will be embedded into Android TV allowing the hardware to mimic Google Chromecast functionality. The preview version of the Google Cast Receiver app is available today on the Play Store.